Nathan Gable wears black low top Converse “Chuck Taylor” All Stars in the film. Trey Caldwell records his pitch to save the Soap Box Derby. We first meet Trey Caldwell (Nathan Gamble) in a series of quick flashbacks interspersed with opening credits. We learn that his father Thomas (Timothy Omundson) presented him with a surprise Christmas present, a kit to build a soapbox derby racing car, and told him that it was his dream to help him build and race it, something he never got around to doing when he was a kid. Then we see that Thomas is in the army reserve and being called to serve in Afghanistan. A third quick flashback shows two army sergeants leaving the Caldwell home after delivering the sad news that Thomas was killed in the line of duty, and Trey and his mother Maggie (Maureen Flanagan) collapsing in grief and tears. There is a big funeral service in the small town of Taft, California where they live, followed by a home gathering where it seems that Trey is the only kid there. Escaping into the garage, Trey knocks over the unfinished derby car in anger and frustration. It doesn’t look like Thomas’ dream for his son will ever be fulfilled. In the weeks following, Trey wanders around with not much purpose in his life, disengaged from schoolwork, and unable to deal with the grieving process. Luckily for Trey, Mrs. Banner (Rolonda Watts), the school principal agrees to tutor him so he can catch up on his schoolwork. She also sets up a meeting for him with Roy Gibbs (Corbin Bernsen) the local fire chief who had a similar tragedy, losing his son during the 9/11 attack. It turns out Roy was a derby champion when he was a boy. When they first meet at the firehouse where Roy works, they don’t hit it off very well. Roy is not interested in rekindling the past and working with a young boy, resenting the attempt from Mrs. Banner to create a surrogate father-son relationship. But to his credit, Trey persists, researching Jason Gibbs death on the Internet, and finding a way to connect with Roy. Roy Gibbs, Mac, and Trey work on the soap box derby car. Now the film goes into standard sports story formula, as the two start to bond and Roy helps Trey complete building the car and teaches him how to race it on 25 Hill Road, a street on the outskirts of town that has the same downward grade as a soap box derby race. After some training montages, Trey and Roy enter different derby races, and suffer only occasional setbacks, like when they compete against Kate Slater (Bailee Madison) who is destined to become a champion. Trey races his way to the state and regional finals and is poised to go to the national champion races in Akron, Ohio. Unfortunately, the national organization is in deep financial trouble, and when Trey persuades Mrs. Banner to take him to visit one of the bankers responsible, he is told that there is no way the banks can extend more credit to the Soap Box Derby which has had suffered from declining interest for a number of years. Not wanting his dream thwarted by mere money, Trey creates a fund raising campaign through the use of a video he makes and posts on the Internet. 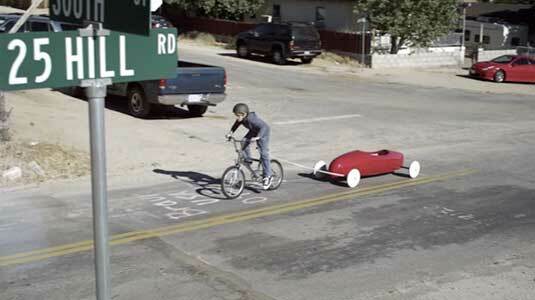 His campaign is very successful and money comes pouring in from all over the country to save the Soap Box Derby. Now the race is on, and one of the main underwriters, Geico Insurance, even sponsors Trey’s car. Trey tows his car up to the top of 25 Hill. The third element of the film is based around the religious beliefs of Trey and the personal problems of Roy, that become more annoying to Trey as they get to know each other. Roy has a drinking problem, and when he is off duty from the fire station, always seems to have a beer in his hand. This is his way of dealing with the emptiness inside him from the loss of his son, Jason. While Roy acknowledges that he likes to drink beer, he says that it is under control. Of course under Hollywood “rules”, this has a dreadful consequence later in the film. The film also takes time to have some religious advice, not content to let the action speak for itself. Trey names his car “Faith and Courage” and makes a point of praying to win his races, somehow feeling that God would take sides in Soap Derby races. Trey asks Mrs. Banner for more assistance. Corbin Bernsen is the main driving force behind this film, producing, directing, and starring in 25 Hill. The film shows all the competence of a skilled and experienced Hollywood professional, with good casting, fine acting, and well-done technical elements, something not always seen in Christian-themed movies. 25 Hill is enjoyable family fare but does have some significant flaws. The first of these is that it relies on a safe formulaic story line, one that was handled better in two previous films about soapbox derby racing, Miracle in Lane 2 and You’ve Got a Friend. Missing also is the element of designing and building a derby car from scratch, not just assembling a kit. The design of the car is a critical part of the racing and learning process that made it such a valuable activity for tween kids. If the film is instead meant to be a character study, there are two elements that don’t ring true in the character of young Trey. First is that he seems to have no friends his own age, either at school or at his church. Normally his peers would be his first resource after a tragedy like the death of a parent, if for nothing else to cheer him up or keep him involved in fun activities. Yet he is portrayed as a loner; he only seems to relate to the adults who take an interest in him. 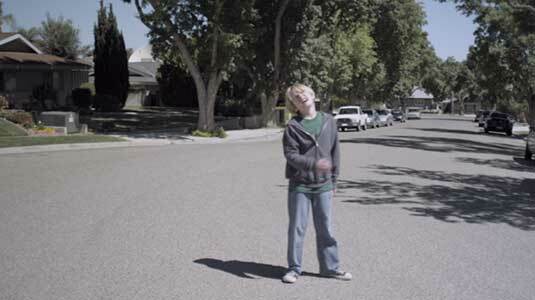 In one scene when his car has disappeared from his garage, his first inclination is to blame kids in town and he seems fearful of them in another scene when he rides by them towing his car on his bicycle. Second is the way he is depicted as just a C student, when it is obvious he has a lot more going for him. An average kid isn’t going to organize a successful national funding raising campaign, nor talk about life with the vocabulary and insights that Trey uses in his conversations with Roy and his mother. Maybe that is just a tribute to Nathan Gamble’s fine performance but is definitely unusual for a 12-year-old C student. In the case of Roy’s character, his bitter outspokenness at times can be refreshing for this type of film genre, but making him a closet alcoholic seems too contrived, placed there as an opening for preaching in the script. He is never shown as drunk when working with Trey, so why does he become so upset at the man who is helping him learn how to race? In real life, a fire chief like Roy would have to have a better handle on his drinking to keep his job. Without providing any more spoilers, it seems his actions did not follow typical protocols at all in a climatic scene toward the end of the film. There are some timeline problems with the fund raising campaign, the restarting of the national derby, and Trey’s travels: an awful lot of things happen in a very small amount of time. It just seemed like this film tried to do too much; as a result it never hit the homerun that it could with a more realistic story. Trey cries out to God in frustration when his car goes missing. Roy finds where Trey has crashed. Nathan Gamble wears black low cut chucks throughout the film. They are cool footwear for an independent minded kid like Trey Caldwell, although camera does not provide much in the way of close ups. The best scene is when Trey is learning to drive the car, and wanting to see what happens when he doesn’t follow Roy’s advice, ends up crashing the car. Trey must get up on his own after the crash. 25 Hill (2011) Nathan Gamble, Maureen Flannigan, Rolonda Watts, Corbin Bernsen, James Greilick, Ralph Waite. Written and directed by Corbin Bernsen.